Technology Trends: The Real Pirates Of Silicon Valley? The Real Pirates Of Silicon Valley? ArcticStartup recently broke the news about an ambitious seasteading endeavor called Blueseedstarted by Silicon Valley founders Max Marty and Dario Mutabdzija. The post came shortly after Max pitched the idea (embedded below) at JumpStartDays on October 17th, in which he received a huge round of applause. Seasteading isn’t a new idea. Other than pirates, one of the first well known attempts at seasteading was the data haven called HavenCo that was located on a sea platform off the coast of England. The sea platform was its own country called Sealand, with its own passports, currency, etc. The project was a direct result of restrictive laws around online gambling. 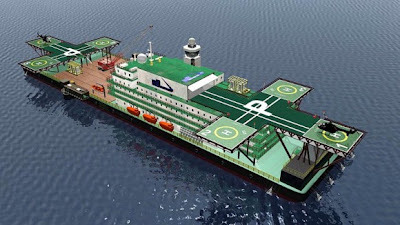 Similar concepts have been developed around floating hospitals called Mercy Ships, where medical treatments are performed on large ocean vessels. While these ships currently serve developing countries, one can imagine how similar ships could provide low cost healthcare all around the world by operating out in the open waters free from the various laws that restrict the ability for inexpensive medical treatments through competitive pricing. Blueseed aims to provide an alternative solution to the US work visa problem for Silicon Valley and allow professionals lacking a visa to legally work in close proximity to companies and investors from the Valley. Blueseed plans to do this by providing living and office accommodations on a vessel anchored 12 nautical miles offshore from California (half an hour by ferry), in international watersoutside the jurisdiction of the United States. Target customers include startup entrepreneurs for whom a satisfactory U.S. work visa solution doesn’t exist, staffing companies impacted by the January 2010 Neufeld memopreventing 3rd party employee placement, and other high-tech professionals interested in the advantages provided by Blueseed’s location. Max became interested in seasteading and creating what he calls the “Googleplex of the sea” after he heard an online talk by Patri Friedman. Max sees seasteading as a response to the reality of the world in which he currently lives in and as a way to change the system from the outside, by simply offering people a better alternative. “If you are comfortable with what you’ve got, that’s fine, but if not, we may have something for you…”. Through complete chance, he eventually met Patri in person at a conference in San Jose and through that luck and serendipity, he ended up joining them at the Seasteading Institute. While director of the institute, Max met his partner Dario. Max had been searching for ways to apply something practical to the concept of seasteading and after looking at things like medical tourism, etc., he decided to become focused on solving a problem near and dear to him. Max is a first generation immigrant and his partner is an immigrant. While Max was in college in Florida, he made friends with amazing and talented people from around the world and after they graduated, they found it incredibly difficult to stay in the US. Most returned home where they started their professional careers, even though that wasn’t what they wanted. They wanted to stay and become part of what once made the US great by helping to create economic growth and prosperity. If you think about many of our entrepreneurial stars in Silicon Valley, you’ll come up with many names of amazing people who came to our country as immigrants. I can name a few off the top of my head such as Max Levchin, Luke Nosek and Alfred Lin, but just for fun and to add gravity to why immigration is so important, you should list as many as you can think of in the comments. “The idea came to me while I was on a Reason cruise. When you are on one of these ships, it feels like you are in a small city and part of a community.” Max and I discussed how his ship would need to be an extension of the Silicon Valley community in order to connect with the right talent and investors. Being so close, people would be able to come to shore on visitor visas and take meetings and have a social life. One of the reasons I didn’t go to Sealand was due to gender ratio. Even though I’m well accustomed at this point being surrounded by men, I can always go home and have my girly hideout, but on a platform and in an intimate setting like that, it just didn’t seem like a good idea. I brought this up with Max and he said that the organization will be actively looking for startups led by female entrepreneurs from around the world. The logistics of doing anything on the ocean are mind boggling. His team is currently raising a round of funding to help get to the next stage of making this dream a reality. With a few investors committed, they are one step closer to getting some of the logistical planning out of the way such as food provisioning, establishing relations with customs and border protection, dealing with Internet access, etc. I don’t know about you, but it seems to me that we can talk about being pirates all we want, but to truly be a pirate, you have to have a ship. This is a crazy idea, but one I would love to see succeed. Hats off to Max and Dario for dreaming big and trying to make a difference in the world.